This past week I was fortunate to have two opportunities to visit three cayes that are just off the coast here in Dangriga. Cayes (pronounced “keys”) are ramparts that consist of chunks of dead coral and other debris that form on the windward edge of the coral reef platform. 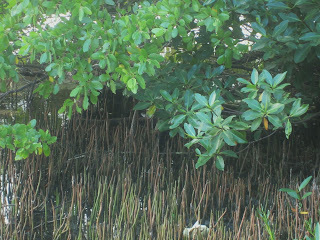 Some have a small sandy beach, and grow coconut palm trees and mangroves. On November 3 I was invited to help chaperone a group of 20 Dangriga primary school students on a field trip to the cayes. About a half an hour by boat from Dangriga are several cayes, only a few of which are inhabited. Our group traveled to three of these cayes with a young marine biologist from Canada, named Donald, who lives and works on the most densely inhabited, Tobacco Caye. We first landed on Twin Cayes, where there is a station for a couple of Belize Fisheries Ministry officials. Their job is to patrol the waters of the Marine Preserve to insure that the fishermen take only the species allowed by Belizean law, and only the prescribed number of conch, lobster and fish so as to not upset the delicate balance of the ecosystem. Donald led us around the caye teaching us about the mangrove forests and sea grass that filters the silt that travels from the mouth of rivers and empties into the Caribbean Sea. He showed us the three types of mangroves that grow on Twin Cayes and the children were taught to identify them and describe the importance of the mangroves for the health of the coral reef. Our next stop was Man-o-War Caye, which is a bird sanctuary. Donald explained to us that we would not disembark, and we should not make any loud noises or sudden moves. We had arrived during the mating season. The two species of birds that inhabit this caye are the brown boobie and the great frigatebird, two birds that live in a symbiotic relationship with one another. The great frigatebird does not dive into salt water, so it eats the left over parts of fish from the brown boobie’s catch. We witnessed the mating rituals of the great frigate bird, especially the inflation of the male frigate’s huge red throat pouch that is especially designed to attract females. Our third destination was Tobacco Caye, the most densely populated caye off the coast of Dangriga, with a population of around 20 people. There are a couple of small tourist hostels, but no hotels, shops or resorts. Tobacco Caye is about the size of an American football field, but only a few buildings have electricity from generators or solar panels. The students found some drums and maracas, and immediately made their own music. They also enjoyed swimming and canoeing for a few hours before we were whisked away back to Dangriga. I returned to Tobacco Caye two days later for a retreat with my colleagues from the Office of the Ministry of Education in Dangriga. Our retreat was facilitated by a Catholic nun, Sister Caritas, who led us in a workshop designed to improve our ability to work as a team. We were fed a wonderful meal of red snapper and had a few hours of R & R together before we had to return to civilization. I am fortunate, indeed, to have these opportunities to visit and explore the beauty that is Belize. Hi Ava. My name is Abigail and I'm in 8th grade in middle school in Washington State. I'm doing a project about the Peace Corp in school, and I was wondering if you could answer some questions and tell me what it's like in Belize. I am really curious about what it is like to be in the Peace Corp! I would be very thankful if you did!